If I had to describe what I love to wear in one line it would be: beautiful things with a story. Vintage Bedouin-style jewelry has held a special place in my heart (and closet) for years because of just that. On the left, earrings (probably not so old, maybe from the last ~20 years); vintage silver bangles; a Bedouin kirdan-style necklace (maybe Yemeni? ), a vintage cuff made of german silver with a rhinestone clasp; and a vintage Bedouin choker. All from the Khan el Khalili bazaar in Cairo. Oh, and some wonderful Pugliese succulents. I grew up spending summers in Cairo and over the many years I visited, the single place I felt epitomized the magic and the beauty of the city, its culture, history and people is the old bazaar, Khan el Khalili. It's not just a place in Cairo, it's my place. As soon as I get there, I feel like I'm home. Winding through narrow alleyways animated by sellers drinking tea and laughing, the smell of freshly baked bread, stray cats slinking by, I customarily make my way to my favorite shops, greeting people along the way that I've come to know. I'm surrounded by the beautiful things that people have made and traded for centuries, things that have passed through an untold number of hands and witnessed countless stories before landing in my own. 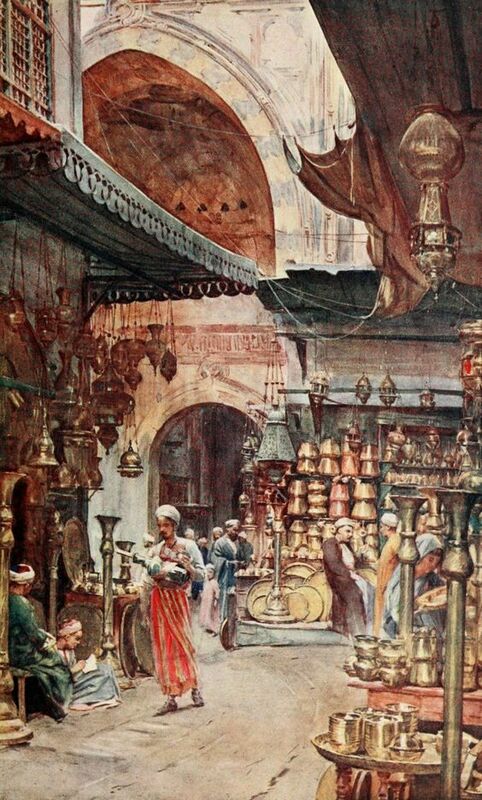 Walter Tyndale, Khan El-Khalil Bazaar, Below the Cataracts 1907. I never walk away empty-handed, always picking up something I fall in love with, maybe more than anything, as a way of trying to take a bit of that magic home with me. In the hierarchy of my buying pleasures, at the very top, is jewelry. Old Bedouin-style jewelry, tinged by a spellbinding patina resulting from the women who wore it, the lives they led, and the time that has passed since. Over the years, I've started a small (but mighty!) collection of this jewelry (I also worked on a social enterprise to get Egyptian artisans in Khan el Khalili to make this kind of jewelry again but that is a story for another time!). And I have to say, every time I wear one of my beloved pieces, I feel remarkably connected- to myself, to my fond memories of Cairo, to my family's history, to a place that has informed so many of the experiences that made me who I am today. I got cactus needles stuck all over my hands (I'm still puling them out) from this innocuous-looking red-tinged cactus. Talk about a model who's an absolute diva. BUT it was worth it. I believe that is the power of style. When we wear something that truly means something to us, something that connects us to who we are at our core, it's like a superhero cape. We come into our full power when what's on the outside brightly reflects what's inside. And after feeling that kind of intimate connection, it's hard to go back to wearing anything that feels anonymous. I haven't been to Cairo in a few years, and lately, I've been feeling the way you do when you truly miss a place. I'm not sure when I'll be able to visit again, but I know this. Almost as soon as I get there, I'll be back in Khan el Khalili, searching for connection.